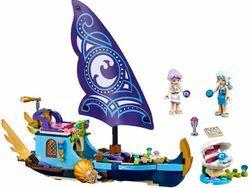 41073 Naida's Epic Adventure Ship is an Elves set released in 2015. This is a description taken from LEGO.com. Please do not modify it. (visit this item's product page) Team up with the Water Elf and Wind Elf on an ocean adventure to find the water key! Facts about "41073 Naida's Epic Adventure Ship"
Team up with the Water Elf and Wind Elf on an ocean adventure to find the water key! This page was last edited on 11 January 2017, at 05:41.